My former foster dog, Maggie Mae, is now the best friend of a high-achieving boy diagnosed with autism! Maggie Mae acts as a “pillow” for her new guardian as he counts to her and reads her stories. His therapists are thrilled with the boy’s progress since Maggie’s arrival. The family has another child, a girl, who loves to play rough with her. Maggie intuitively knows how to behave with both children. 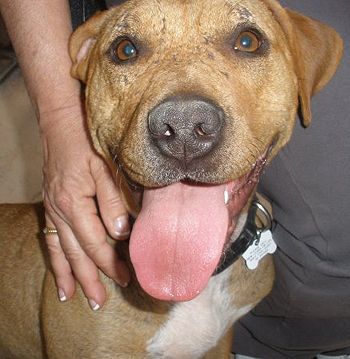 Maggie Mae was rescued by lifeguards from Hansen Dam in Los Angeles. 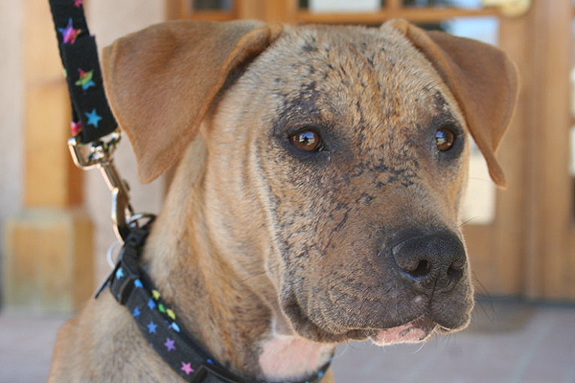 They took her to East Valley Animal Shelter, where she was going to put her down due to her severe case of mange. One of the shelter workers begged to be given 24 hours while she contacted New Leash on Life Animal Rescue. That was the beginning of her freedom and how I became her foster mom. During a nine-month healing process, Maggie Mae learned socialization skills from my two dogs, Penny and Max. Penny, the brindle, taught her how to play, and Max licked her wounds. Maggie and I had spa time in the shower together three times a week during which I would administer Malaseb shampoo, and then just let the steam soothe and settle it into her skin. With the care she received in our home, along with the appropriate medications, she healed. 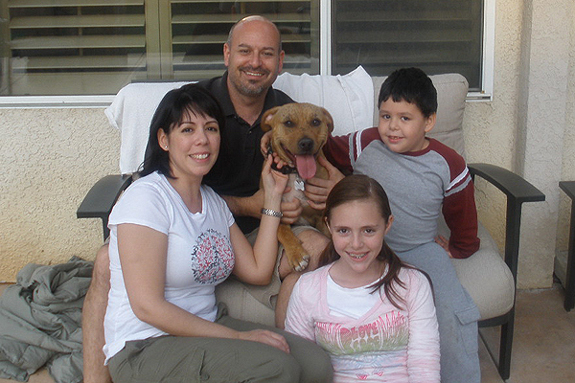 When Maggie was ready for adoption, this amazing family came to meet her and the rest is history. The rescued becomes the rescuer! While I miss her, I do get to visit her. I know she is very happy and she’s doing good work. 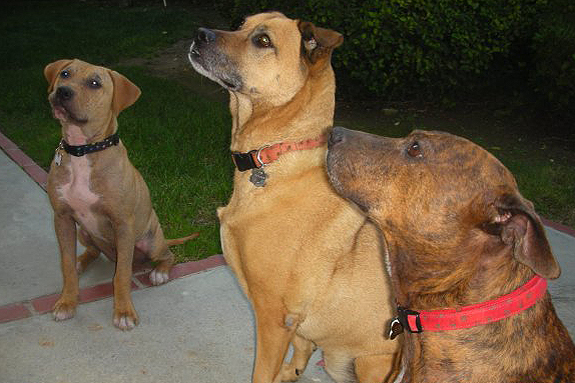 Maggie is one special dog, and her story is one of many. Both of my other dogs are also rescues. Penny, a pit bull/German Shorthair Pointer was abandoned on a construction site in Beverly Hills. Penny was pregnant and had a broken leg. The foreman was feeding her, but the workers were taunting and abusing her. In the middle of the night she gave birth, but all her pups were killed by coyotes. The following morning, the workers were putting out poison, but the foreman contacted a friend of New Leash On Life Animal Rescue, who took her to Villalobos for boarding. Penny needed more attention then she could get there. At an adoption event, I was asked if I could get her out of Villalobos and provide her a comfortable home. Although she wasn’t my normal preference, I couldn’t say no considering her circumstances. Soon after, Max, my other rescue, fell in love with Penny, and I just couldn’t let her go! Penny was so traumatized she was eating the pads off her paws. Her nickname became Socks because I would duct tape socks on her feet to help protect her feet from her chewing. However, she managed to chew through every pair. One early morning, Max and Penny got out of my yard. A man called and asked if I had a dog named Max and his girlfriend, Socks! At the time, I had sons in high school. Penny was so petrified of their shoes and boots that she would run up the back hill and hide. With the help of my son’s friends, who were gentle, patient and loving, she warmed up and began to trust us. Today, her only residual problem is that she can’t stand the sound of my stapler. I try to talk her through it, but she usually exits stage left. Max has his own story too. Max is the reason I became passionate about saving animals. One of my first adoption events was at an off leash dog park. The local city- and county-run shelters were there to adopt out all they could. 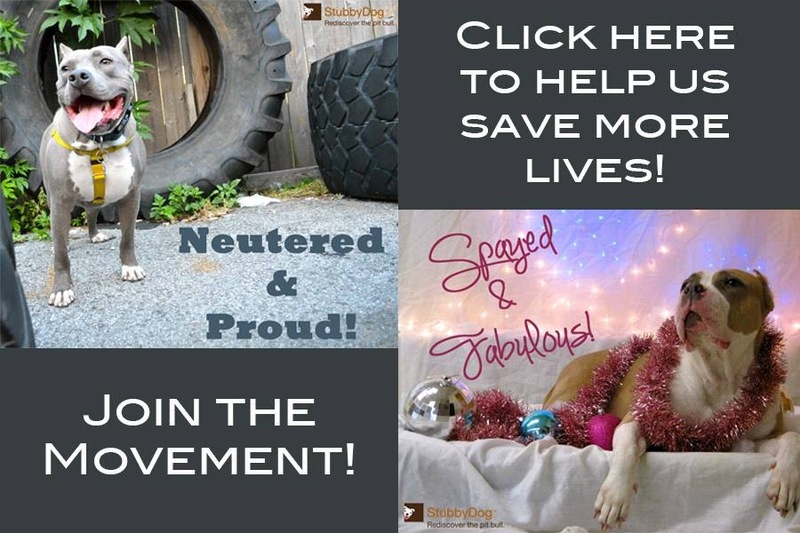 While New Leash On Life attended the event, we were there to help educate the public about the importance of spaying and neutering pets, not to adopt out our dogs. We did, however, bring Max. It was a very hot day and I was Max’s handler. Towards the end of the day, I sat down in the grass, and he immediately laid behind me, wrapping his body around mine, totally supporting my back. Since then Max has always “had my back” and is a treasured member of our family. It is amazing what good can come from bad, sometimes hopeless situations. Dogs are so smart, and I do believe the ones we save show their appreciation tenfold! My wish is for everyone to do something – anything – everyday. What a wonderful world it would be!